It is unfortunate that we are not able to get connected a Terminal Services session via the Remote Web Workplace on our iMac. It would not be feasible to have 10 Macs connected via RRAS on any given day. This would be a bandwidth killer. But, on occasion, a connection to the server for management may be needed, or a user may need access to their XP Pro/Vista Business box at work and they have a Mac at home. To get around this, we need to create a PPTP VPN connection to the server. Double click on Internet Connect.asp. Click on the VPN Lock. "Your computer needs to be set up to make VPN connections." Click on PPTP. Authenticate by inputting your Mac access password if requested. Put your SBS login name in "Account Name". Start the Remote Desktop Client and connect using the FQDN (Fully Qualified Domain Name: mysbsbox.myinternallan.lan). This is a quick, in-a-pinch, kind of solution. One would think that it would be possible to connect to a shared company folder as well. But, so far we are not able to connect to the remote SBS box over the VPN. 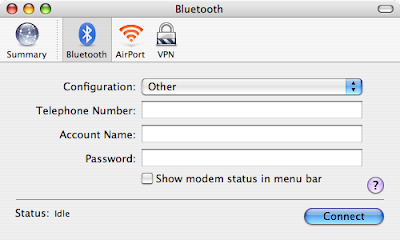 This is by either clicking on the Network icon in Finder, or typing the FQDN of the SBS server in the Search. A little bit more research is in order because Apple's Web site indicates that it should be possible: Windows: Join the Network. Ah, here we go: Subject: Viewing Shares via VPN PPTP Mac OSX to SBS 2000.